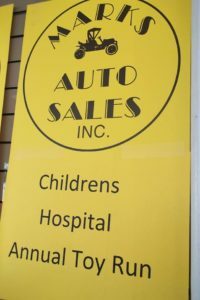 Mark’s Auto Sales is here to help. Let us get you driving today! When is my first car payment after purchase? If you financed your used car purchase, you’re well aware that you will be needing to make payments. 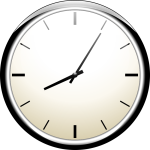 Regardless of whether you purchased your vehicle from Mark’s Auto Sales with buy here pay here financing, or other financing like bank or credit union, or if you purchased from another dealer, you will find your paperwork from the closing helpful to figure out your payment date. On the buyer’s order and “mortgage” you will find the financing details including the first payment date, the amount of your payments, and the frequency of your payments (along with details about how many total payments, and your interest rate). If you purchased with buy here pay here financing with Mark’s Auto Sales, and you don’t want to try to keep track of each payment, you can make your payments online manually, or set them to recur with our PortalPay system. Please contact your Mark’s Auto Sales account rep in order to get started with the PortalPay system if you haven’t used it already. Have other questions about financing a vehicle? Please comment on this post so that we can answer you car financing and car buying questions for you! 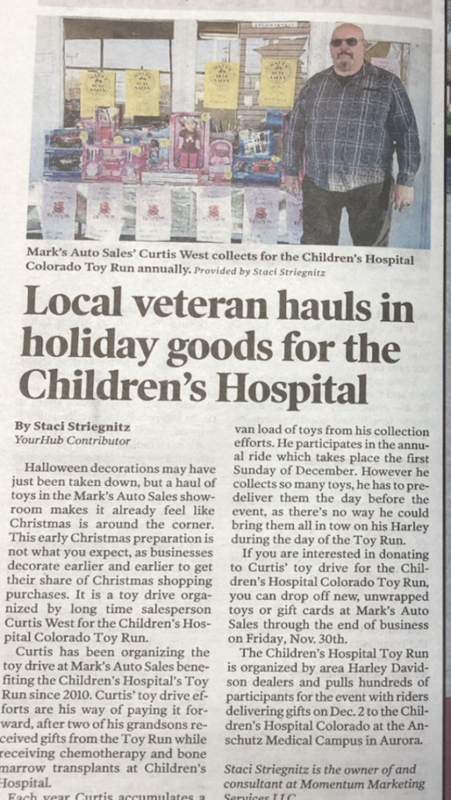 We are grateful that the Denver Post recognized Curtis West, the organizer of the Toy Run toy drive each year at Mark’s Auto Sales in the Thursday November 22nd edition. The toy drive runs through Friday of next week, so there’s still time if you would like to drop off a gift or a few bucks in the donation jar. The toys will be delivered to Children’s Hospital as part of the annual Toy Run. Santa is making his annual stop and you’re invited! 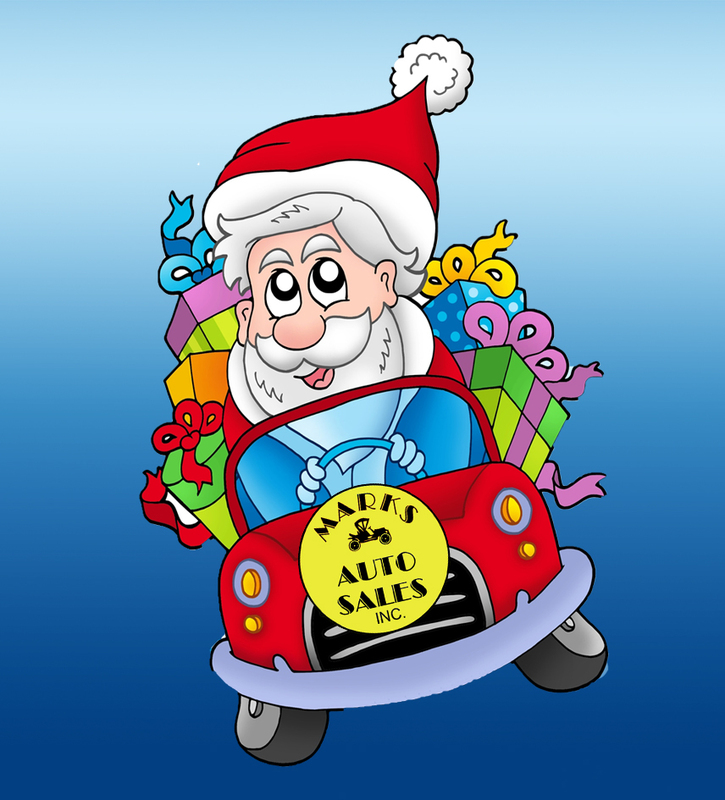 Skip the line at the mall and get your FREE souvenir photo with Santa at Santa’s annual trip to Mark’s Auto Sales. Each year Santa comes to Mark’s Autos for a few hours to meet and greet with children and families to hear Christmas wishes before he loads up his sleigh. What: Free visits and photos with Santa! Who: All are WELCOME! Whether or not you’re a customer, we welcome everyone in our community to come visit with Santa! Don’t forget about the party, RSVP or mark “Interested” on the Facebook Event page! Halloween decorations may have just been taken down, but a haul of toys in the Mark’s Auto Sales showroom makes it already feel like Christmas is around the corner. This early Christmas preparation is not what you expect, as businesses decorate earlier and earlier to get their share of Christmas shopping purchases. It is a toy drive organized by long time salesperson, Curtis West, for the Children’s Hospital Colorado Toy Run. 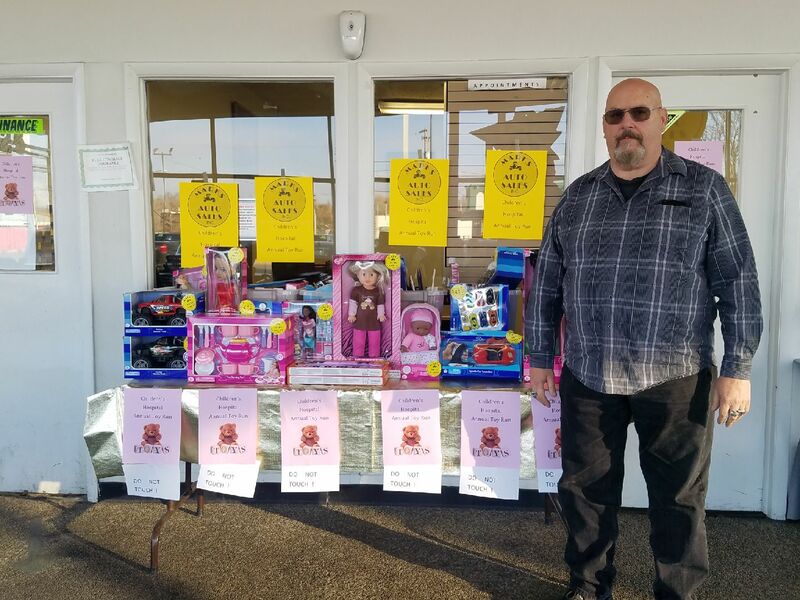 Curtis has been organizing the toy drive at Mark’s Auto Sales benefiting the Children’s Hospital’s Toy Run since 2010. Curtis’ toy drive efforts are his way of paying it forward, after two of his grandsons received gifts from the Toy Run while receiving chemo and bone marrow transplants at Children’s Hospital. Each year Curtis accumulates a van load of toys from his collection efforts. He participates in the annual ride which takes place the first Sunday of December. However he collects so many toys, he has to pre-deliver them the day before the event, as there’s no way he could bring them all in tow on his Harley during the day of the Toy Run. 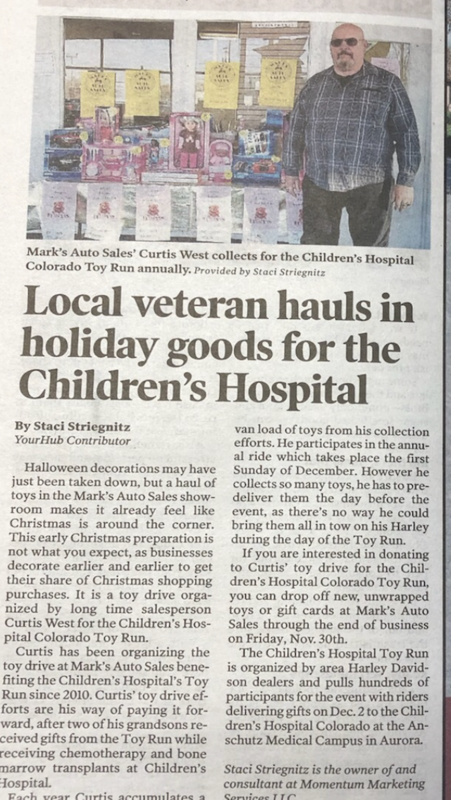 If you are interested in donating to Curtis’ toy drive for the Children’s Hospital Colorado Toy Run, you can drop off new, unwrapped toys or gift cards at Mark’s Auto Sales through the end of business on Friday November 30th. The Children’s Hospital Toy Run is organized by area Harley Davidson dealers and pulls hundreds of riders/participants for the Toy Run event with riders delivering gifts to the Children’s Hospital Colorado. On Sunday December 2, 2018 registered participants will ride their motorcycles and deliver toys to the Children’s Hospital Colorado Anschutz Medical Campus in Aurora. 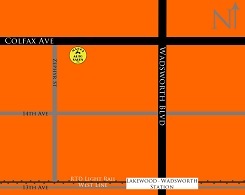 Mark’s Auto Sales Inc is a family owned used car dealership in Lakewood. Learn more at marksautosales.com. 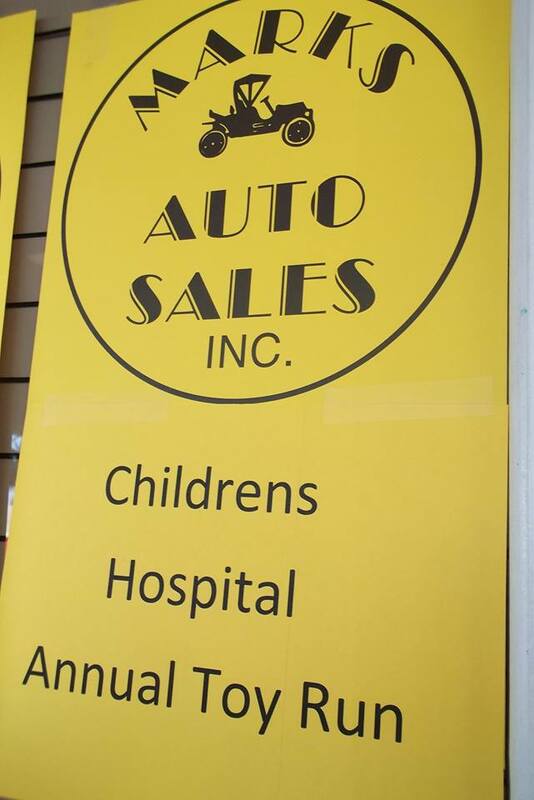 Mark’s Auto Sales is excited to be collecting toys for the annual Children’s Hospital Toy Run. Have a toy to donate for the Children’s Hospital Colorado Toy Run? Drop it off in our donation boxes. Make sure every child has a great Christmas this year! Find us on Google and share your review.#smallthanks. When should you buy your first car? Buying a car and getting financed can be very stressful even for someone who has bought multiple cars through the years. When buying a first car, it may be the biggest purchase you’ve made in your life, up to this point. 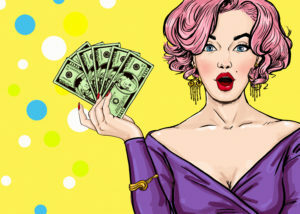 You may be wondering if you should buy a cheap cash vehicle or use your cash funds as a down payment. For the most part, there are few great vehicles for sale under $2000. If they run, they may have high mileage (sometimes 200,000+ miles), heavy wear, or there is a known problem with a mechanical system. If you or someone you’re close to is a mechanic, and you can reasonably budget for the vehicle purchase price, and the parts and labor, then it might be a good option. If you don’t have even a ballpark estimate for fixing a major repair, you may not want to do a cheap cash car. Financing your first vehicle brings up additional considerations including credit score, and financing approval. Most first time car buyers do not have extensive credit history. Some may have a credit card, or store charge card, while others may have no credit history. When applying for financing the dealer will check your credit report. If you have established some credit with a credit card, there may be a first time buyer financing program available with a bank or credit union. 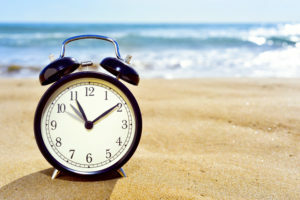 If you haven’t established any credit, have carried a balance, or been late on payments, there may still be a financing option so long as the other factors of qualification are met. 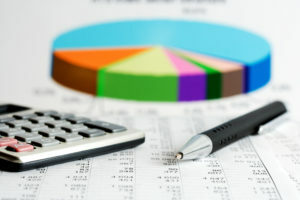 In order to get financing, the lender will want to be sure that your income is stable. 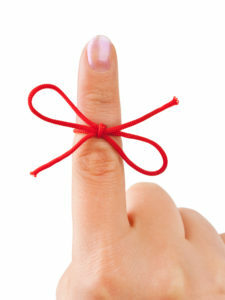 You will need to prove your income with pay stubs with at least six months time on the job. Roadblocks to proving income is if you cannot prove cash income from a side job, or if you’re unable to prove your tips. The more time at a job shows a greater stability to make car payments. If you have started a new job, and don’t want to go the cash purchase route, your financing options will be better if you have at least six months work history with your employer before financing a car purchase. One of the biggest financing challenges for first time car buyers is proving their residence. Many young adults ages 18-25 will purchase their first vehicle while living with relatives. They might not be on the lease, or have utilities in their name. 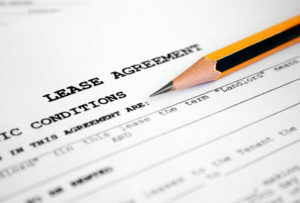 The best proof of residence is a current lease stating the applicants name with the property address. Also accepted are utility invoices that include the applicant’s name, address, address, and an invoice dated within 30 days of the application date to purchase. If it arrived by mail, keep the postmarked envelope that the bill came in to prove the mail was delivered to that address. Some underwriters will be selective of what bills they will accept as proof of residence. Utilities including water bills, electricity and gas, and cable are tied to providing a service at a specific residence/address, and should be widely accepted between lenders. A personal letter, junk mail, or a handwritten note by a relative stating that you live with them will not suffice for proof of residence, nor give the lender confidence about your creditworthiness. If you are looking to finance a car purchase as a first time car buyer it is in your best interest to pick up a utility bill in your name, if you do not have a lease in your name. The good news is once you have gotten an approval, you’ll never again be a first time car buyer. This is your opportunity to establish a positive payment history on an installment line of credit. Banks and credit unions will report your credit history, as well as some buy here pay here dealers like Mark’s Auto Sales. Whether you pay off your vehicle, or trade it in after a couple years, your positive payment history will help you in future car purchases. So is there a best age to buy your first car? Based on qualification factors, such as proof of residence and proof of income, there isn’t a set perfect age for everyone. Depending on where you live there may be better alternatives like public transportation, or higher expenses related to car ownership, such as parking fees, which may hold you off from choosing to purchase now. As a car buyer, this is your shot to decide if you’re ready for the responsibility of a car payment. Can you budget a down payment, make the car payment and cover other related expenses including insurance, maintenance, and gas? Then now may be a great time. 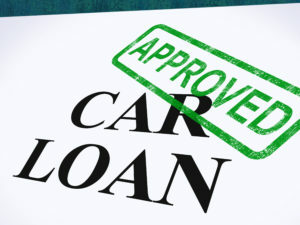 Click here to inquire about financing as a first time car buyer. If you foresee changing jobs or moving out of the area soon, it may not be the best time, but there’s no reason not to start saving for a down payment now, for when you’re ready to make the purchase. Here are some of our tips to saving a down payment.